Published: Jan. 23, 2013 at 06:47 p.m. Updated: Jan. 23, 2013 at 11:26 p.m.
Colin Kaepernick is taking steps to trademark his meme stardom. For Colin Kaepernick, anything feels possible. He's on the doorstep of Super Bowl glory and even has his own dangerously predictable Internet meme. Eric Branch of The San Francisco Chronicle reported Wednesday that the San Francisco 49ers' starting quarterback has filed to trademark the term "Kaepernicking," per the U.S. Patent and Trademark Office. 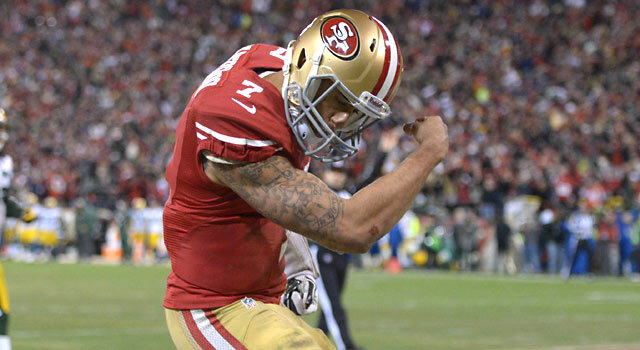 The craze, borne out of Kaepernick's tendency to celebrate touchdowns by flexing his right arm and kissing his bicep, has led to a flood of fan-generated Internet photos copying the pose. The fad -- which we swear sailors and wrestler-types have been doing for generations -- comes on the heels of Griffining, Bradying, Gronking, and the grandaddy of them all: Tebowing. Reports suggest the societally unnerving streak of "Horsemanning" has nothing to do with the Denver Broncos or their quarterback. A nation asleep at the wheel barrels onward.